Chandlery Yacht Sales is proud to represent the MJM Yacht line of fine power yachts. Today we’d like to introduce you to one of their exceptional craft, the MJM 40z. In this article we will provide info on its features, specifications, and independent reviews from Boat Test and Yachting Magazine. The MJM 40z is a 40′ power yacht known for combining luxury features with exceptional fuel economy. The build of this craft is darn fine. The material selection makes for a very strong, yet lightweight hull. The power plant by Volvo Penta is reliable and serviceable no matter what port you call home. The interior design is well thought out, giving you and your family great features and true comfort for both day trips and overnight excursions. Please enjoy the MKM 40z review videos below for an in-depth look of this vessel. 28.6 GPH / 1.1nmpg @ 32.5 knot cruising speed. Most comparable boats are in the 40+ GMH range. Safty is important, especially on those island trips. Innovative, comfortable and spacious layout and design. Flush deck with side boarding doors at floating dock level. Advanced Epoxy, Eglass, Kevlar composite construction. Super strong yet light construction helps fuel efficiency. Twin 370 HP Volvo Penta IPS Pod Drives (Option for 435 HP). IPS joystick docking with DPS station-keeping. Docking made easy, even single handed. Seakeeper gyro stabilizer – option. Gyro enhanced comfort at sea. Convertible 3-stateroom sleeping for up to 6. The MJM 40z is a unique vessel, born of experience, refined through the input of active owners, and realized at the highest levels of the boat builder’s art. Detail runs deep. For example, when the time comes to socialize, the helm and companion seats swivel around and drop to the level of the port and starboard lounges in the pilothouse. 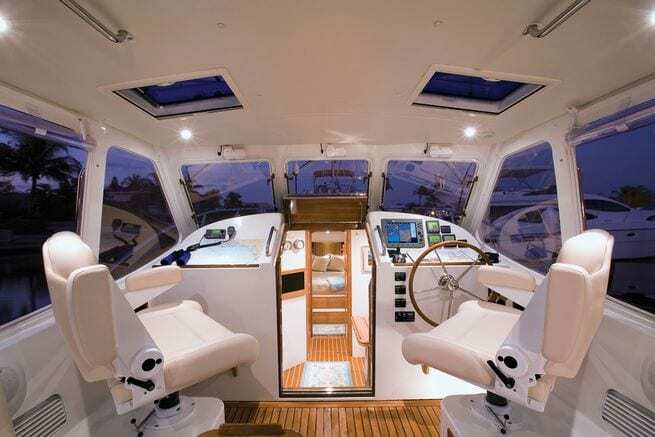 In fair weather with the aft curtains drawn back, the pilothouse and cockpit — all on the same level — become one continuous family and friends space. Port and starboard cockpit boarding doors facilitate line handling, grocery toting and dockside entertaining. I was mighty proud of my boat. This is the first long day trip that I have made on GANDER and her performance in rough seas, as well as calm, was second to none. 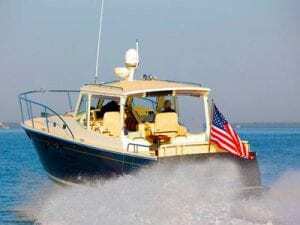 The MJM 40z is truly an all-weather all-conditions boat.